If you were not cast please consider auditioning for another TCT production. efore you can be on stage, you've got to audition. 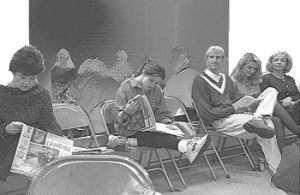 While TCT has been fortunate to have many people try-out for our plays over the years, we've also had a few times when the casting committee members have sat, scratching their collective heads, and wondering if everyone had decided to leave town that week. The point is, we need you! This isn't professional theatre -- these are your neighbors -- you don't have to prepare (unless the director requires this, in which case you'll be told what to bring with you). All you need is a desire to be on stage, and you know you have that. Think about all the times you've attended a play -- not necessarily at the Lyric, but anywhere -- and thought to yourself, "I could do better than that", or "That looks like fun!" Everyday, we all "act" a part: we have our "job" personality; we act out our roles as parents, children, and friends; we put on our "best face" when meeting new people. So, you know you can act, and you know you want to be on stage. Take that next small step and become a part of Tupelo Community Theatre! We've included a sample audition form for you. As you can see, the questions aren't hard and, if you really are hesitating about being in the limelight, try getting your feet wet as a member of the stagecrew. A lot of our best actors and actresses started backstage. We'll see you at the Lyric!